No Tax Return? No W2? No Problem! If you are among the 15 million Americans who are self-employed, you’ll be glad to know that we understand how your financial profile can be different from borrowers who earn a regular salary. We have loans designed specifically for self-employed individuals – so you won’t be asked to submit documents and forms that you don’t have. 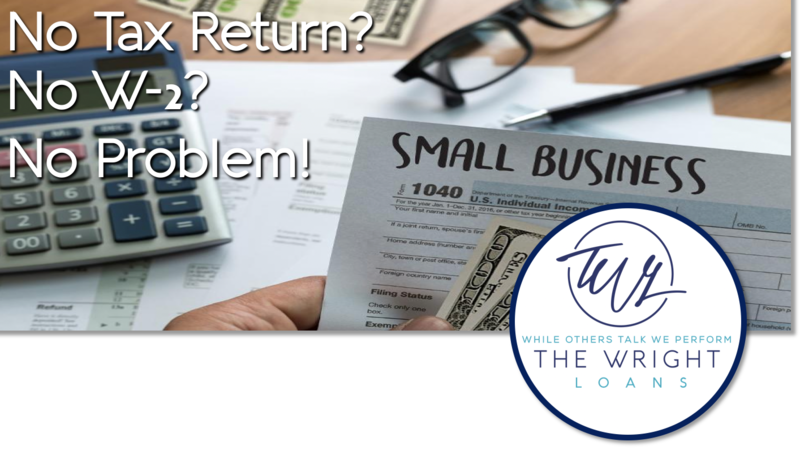 If you can't provide proof if income or you are like most other business owners who have an overage of tax deductions, we can help you! If you own your own business or are self-employed, you know that getting a mortgage can be difficult. Regardless of what you make for income, the system of tax write-offs that make your job profitable keeps holding you back from buying a home. That’s because lenders are forced to look at your tax statements and not your bank statements when they make a credit decision on your mortgage. The Bank Statement Mortgage is here to change all of that. After the crash of the housing market in 2008, the federal government took custodianship over Fannie Mae and Freddie Mac, the two largest lenders in the country. They were so large that if they failed, they would put thousands of homeowners out on the street, so the government stepped in. While this led to many of the great loan programs that we have today, including HARP and FHA that let homeowners recover from being underwater or buy a home with less money down, they also made it far more difficult for business owners and self-employed people to buy a home. Entrepreneurs and self-employed workers were now required to prove their income by what they pay in taxes, not what they made. This has kept everyone from doctors and lawyers to real estate agents and web designers from buying a home, as they are forced to write off business expenses merely to keep their companies or practices profitable. This shows as less income made for taxes but doesn’t show the true income that they make. This means that they can’t buy a home that is on the proper level to what they make but instead must settle for less home or continue to rent. The Bank Statement Mortgage changes all of that. With guidelines changing, we are now the first mortgage bank to offer self-employed individuals the flexibility of a bank statement mortgage, where we check your bank statements for mortgage viability. This way, you can write off all your business expenses, keeping your business profitable and healthy. I look forward to helping you achieve your investment and housing dreams, give me a call.